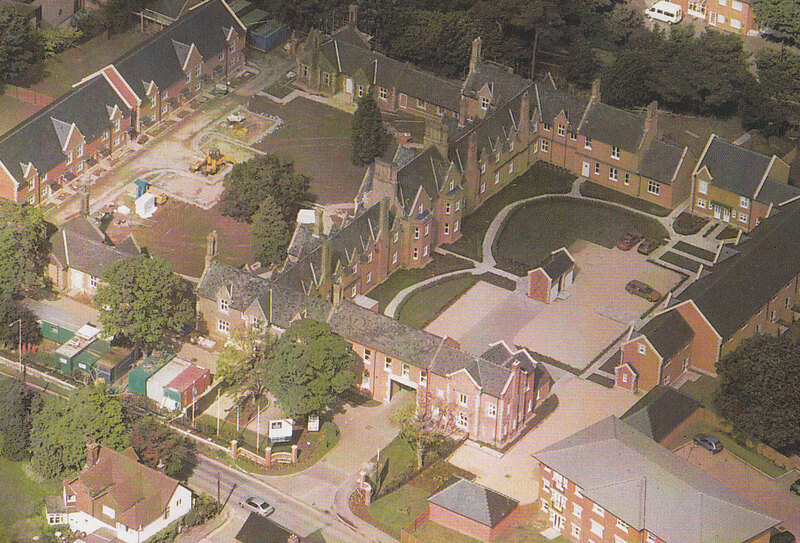 Aerial Photo of the St. Andrews site, previously the workhouse, as the new development was nearing completion. The new buidings are on the long sides of the squares on the right and left of the photo. When walking past the Stock Road site of the former Billericay Union Workhouse, it’s difficult to imagine what life was like for those who were forced by unemployment, homelessness, illness or other catastrophe to seek shelter within its walls. Although a housing estate covers much of what was once Workhouse land, evidence of the original buildings can still be seen, as designed by the eminent Victorian architect, George Gilbert Scott. The original Billericay Workhouse was built in 1840 on a site of approximately 11 acres. It was established as a direct response to the 1834 Poor Law Amendment Act, which was designed to deal with what the authorities perceived as escalating costs (and other problems) associated with the piecemeal Poor Law legislation passed during previous years. The aim was to reduce the financial burden on taxpayers’ of providing assistance to the infirm and destitute, and thus make better use of ratepayers’ money throughout the country (sound familiar?). The catchment area of Billericay Union Workhouse comprised the needy poor of 25 local parishes. The completed Workhouse buildings allowed for separate reception areas for men and women, children’s accommodation, workrooms, a chapel, administration quarters, and areas where domestic tasks such as cooking and sewing were performed. Land attached was designated for cultivation by – who else? – the inmates themselves. Only those exempted by extreme infirmity were not expected to earn their keep, often by means of hard and tedious tasks, such as oakum picking (unravelling lengths of rope), stone-breaking (for use in paths and roads), gardening, and the mainly female province of domestic/nursing work. In the belief that their parents’ need to seek charity constituted “a bad influence”, children were routinely separated from their parents, and family members rarely met whilst resident within the Workhouse walls. The 1834 Act was aimed at discouraging people from applying for ‘charity’ by ensuring that the lowest level of paid work outside the workhouse would be preferable to the degrading and arduous life within its’ walls. The choices were simple for those unable to work – find some kind of paid employment, or enter the strictly regimented workhouse or ‘House’, as it became known, thus earning the shameful label of ‘pauper’. The alternative, if you refused to swallow your pride, was to keep your family outside the workhouse and possibly starve. Financial assistance given to people still residing in their homes was extremely limited, and usually only given in the case of long-term sickness or disablement. From the beginning, the Workhouse was supervised by a salaried Master, directly responsible to the Board of Guardians. The Guardians comprised prominent local gentry, clergy and businessmen. Perhaps the best known of all the Billericay Workhouse Masters was Walter Needham, a man capable and efficient enough to satisfy the Board of Guardians, but compassionate enough to be remembered with some affection. Needham took over in the 1890s. His daughter, Mary, was born in the Workhouse, and lived locally, surviving well into her 90’s. Regular meetings of the Board of Guardians were held and duly minuted. The Minute Books – held at Essex Record Office, Chelmsford – are fascinating and well worth studying, giving valuable insights into the mindset of those responsible for ensuring that “the House” was correctly (and economically!) run. After the Workhouse was built, additional building took place very quickly, to cope with demand and changing circumstances, such as periods of high unemployment and agricultural ‘slump’. In 1897, a 44-bed Infirmary was built, and in 1924 a separate building for tubercular patients. Judged by today’s standards, the very idea of the workhouse and family separation - a routine and accepted part of workhouse life – seems barbaric. Although conditions in some institutions throughout the country were indeed dire, in the better-run workhouses standards of cleanliness and good medical care were maintained. This meant that inmates without the wherewithal to pay for medical treatment (pre-NHS ‘cradle to the grave’ care) were able to receive medical attention. There is no doubt that the services provided by the NHS and Social Services today have their roots in the provisions offered within workhouses. In 1904, the Minutes record a debate concerning the need for economy in use of medical dressings, which provoked a retort from the Workhouse Medical Officer (a certain rather outspoken Dr J Douglas Wells) that.. ”staff are already as economical as possible”. In 1928, we find Dr Wells complaining waspishly about delays in fulfilling his request for purchase of an additional operating trolley; whereupon the Guardians rebuke him for his “discourtesy” and remind him that.. “resignation is an option if he considers conditions unsatisfactory”! As the years advance, and people began to question the whole idea of Workhouse provision, Minute Book entries dispute some traditionally held beliefs that life on “Parish relief” meant being treated with unmitigated severity and contempt. Regular entries at Christmas concern small additional allowances paid to those living outside the workhouse, and throughout the period records show additional provision of Christmas cheer for inmates (including fruit, tobacco, and cakes for adults, and toys and sweets for the children). No doubt some items would be donated, but also recorded are decorations “throughout all the wards”, musical entertainments for one week, and games for the children. Accounts and receipts for provisions were recorded within the Minutes, and any complaints about quality of food carefully recorded; two instances of complaints about bread prompted Guardians to quickly approach another supplier for a quotation. When an offer of donated beer was discussed, the motion against distribution was defeated by 12 votes to 3 (no doubt to the relief of the inmates, should they have come to hear of it!). Later, in 1911, the Minutes record a Guardian stating that……”the time has come when the word “pauper” should not be used, when speaking of the chargeable poor”. In October 1911, one of the Guardians, a Mr West, comments….”if we cannot do it legally, let us do it illegally”, a statement which relates to a request for the transfer, on compassionate grounds, of an elderly lady from the Bethnal Green Workhouse to the one at Billericay. In 1928 and 1929, there are records of expenditure being approved for massage treatment for an inmate’s son, with an accompanying note from Mrs Todd, the child’s mother, thanking the Guardians for their kindness. Finance for children to attend Scout Camp and for seaside trips (to Dymchurch) during their school summer holidays is also sanctioned as the 20th century advances. However, some recorded Minute Book entries do make disturbing reading. In 1904, the Guardians debated whether it was essential for their health that children be given luncheon, as they were already fed at breakfast and dinner! In 1927, the cost of £1 1s. 0d (one pound and five pence in today’s money) to anaesthetise children undergoing tonsillectomies is questioned as possibly … “an unfair burden to ratepayers”.. However, we have to remember that the Guardians were strictly accountable to Central Government and the ratepayers for disbursement of expenditure, and strong feelings still prevailed amongst many that “pauperism” should be discouraged by every means. Certainly, the Guardians appear to have been shrewd and far-sighted where finance was concerned – 1904 Minutes record the purchase of “three freehold cottages….an excellent investment at £180” . An early attempt at property speculation, perhaps? The 1929 Local Government Act ushered in steps to begin the abolition of Workhouses. Around this time the name was changed to St Andrew’s Hospital, avoiding the stigma associated with the label of ‘workhouse’. However, thiis was still a place to which only those who were too poor to afford private care, or without family to help them in times of sickness, trouble and infirmity, would apply. Nevertheless, it’s interesting to note that in 1934, the County Medical Officer of Health stated that (the Workhouse)……”could be developed into an excellent surgical unit….”(“ChelmsfordChronicle”, 16 May 1934). The Second World War saw the hospital became part of the Emergency Medical Services, and preparations began to receive unknown numbers of casualties, both Service personnel and civilians. Some staff were transferred from the London Hospital , and they would continue their medical training whilst working at Billericay. Although personnel eventually returned to the London Hospital at the end of the War, nursing training still continued at St Andrew’s post-war. The majority of the Hospital’s services were re-located elsewhere in 1997 and much of the land sold for the housing development we can see today. Primary Sources consulted : Minute Books, Meetings of the Board of Guardians, Billericay Workhouse, 1890 – 1929 Ref: G/Bi/M19 /M20, /M21, /M22, /M23, /M24, /M25, /M26, /M27, /M27, /M28, /M29, /M30, /M31, /M32, /M33, Essex Record Office, Chelmsford . Whilst completing my family history I found out that my great grandmother had died in 1947 in the Billericay workhouse, where she had chosen to live. My mother remembers her weekly visits there when the ladies would greet visitors by sitting in a circle with their handbags. Because she had chosen to be there her two sons had to pay a shilling each, every week towards her keep. My mother was there the day she died after she was taken poorly during a visit and knows it was absolutely within the workhouse as they returned to the visitor room to tell her mother she had passed. However, her death certificate gives her place of death as ‘The Retreat’ Billericay. I have spent a lot of time trying to find and explanation for this but have never found one. Since then I have found another Billericay Workhouse death that has also been registered as ‘The Retreat’. Does anyone know the answer? I was trained at St Andrew’s Hospital in the late fifties, and had a wonderful time, with Miss Mason as matron, and Sisters Willis and Dean as home sisters. Some of the original children who had grown up in the workhouse, had stayed when it was closed, and had become ward maids. They lived in the “shelters” behind the maternity block, and were wonderful people, so proud of their wards. I particularly remember Ivy May Stanley, and another maid called Dorothy, both of whom, in later life, I had the privilege of caring for in the sheltered scheme which I ran. I do hope that I was able to repay the kindness they showed me when I was a very new girl at Billericay. Over in the wards of the workhouse, (later Charles ward) they still had enormous hooks in the walls, which used, in the workhouse years to hold a thick rope, erected each night. Poor people requiring protection for the night, could pay a penny, and be allowed to sleep on the clothesline, as they called it, by draping their arms over the rope, to prop themselves upright. I wonder if those hooks were removed when the building was converted into apartments?